Net 30 Terms is a payment option that lets you place purchases now and pay in thirty days. By signing up for Net 30 Terms, you and your company’s subaccount users will be given a shared credit line with no annual fee. This Website Features Guide provides information on how to sign up for and manage a Net 30 Terms account. Fill out the Net 30 Terms application. Please note that you must be the primary account holder in order to apply. With a NeweggBusiness Net 30 Terms account, you are issued an invoice after you place an order, which becomes due after 30 days. In the account management portal, you can filter by recent invoices, all open invoices, past-due invoices, and unapplied credits. Below, we have included a description of each element found in an invoice. The Net 30 Terms program requires you to designate a single primary contact and primary physical mailing address to receive invoices. In addition, up to five e-mail addresses can be chosen to receive invoice e-mails. This information can be updated at any time on your Net Terms Account Management page. Please see the How-to-Use section below for instructions. Pay your invoice by check or wire transfer. After payment has been sent, update the payment status on the Net 30 Terms Account Management page. Log on to your NeweggBusiness account. Go to your My Account page by clicking the button at the top right. 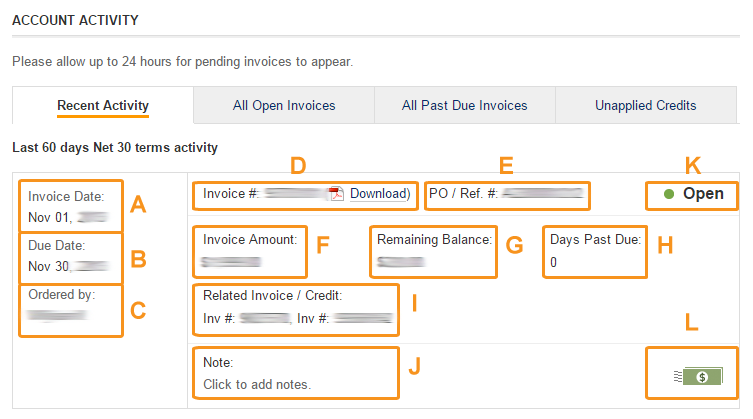 Click on Account Invoices in the Net 30 Terms Account section. 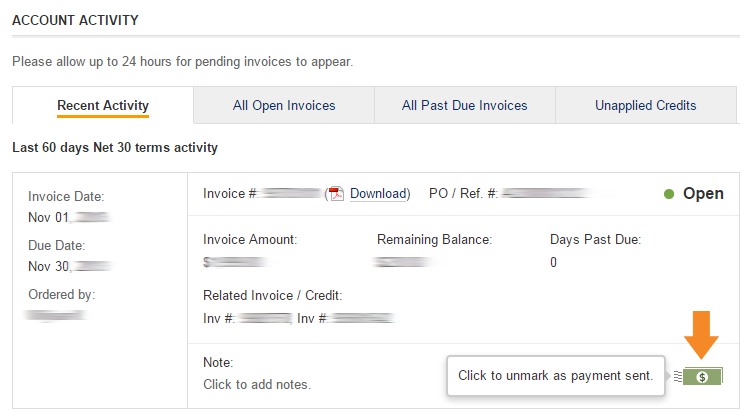 Find the invoice that you sent payment for and click the icon marking the payment as sent. 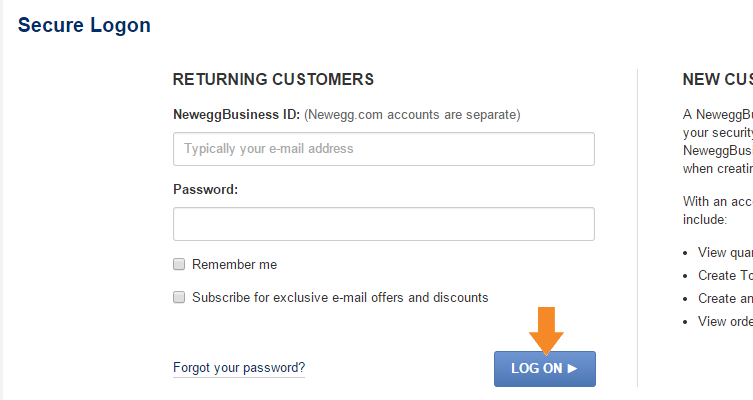 Log into your NeweggBusiness account and navigate to your My Account page. Open the Request credit line increase link. 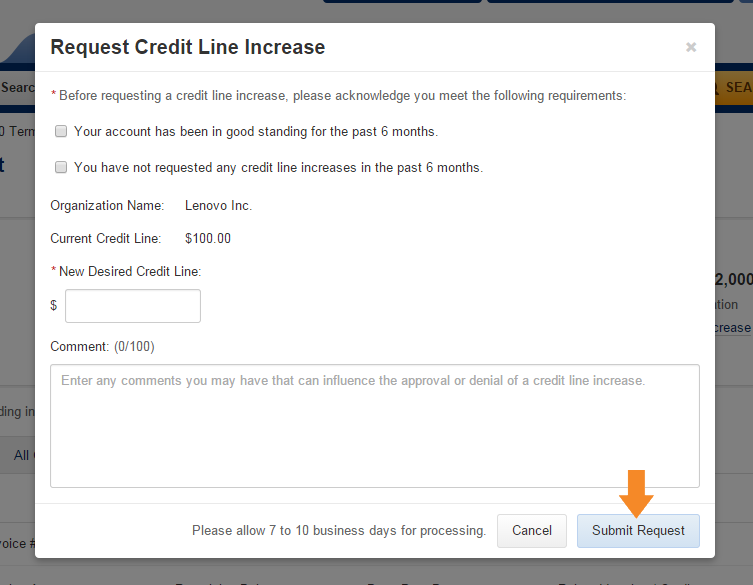 Fill out the Request Credit Line Increase form and click the Submit Request button. To apply a credited amount to an unpaid invoice, please contact Accounts Receivable at accounting@neweggbusiness.com. Click on Primary Billing Content in the Net 30 Terms Account section. Enter the new contact in the fields and click Update Billing Contact. Click on Invoice Mailing Address in the Net 30 Terms Account section. Enter the new information and click Update Mailing Contact. Click on Invoice E-mail Recipients in the Net 30 Terms Account section. Enter the updated information in the field(s) and click Update E-mails.